Black Magic Sanction has Rachel Morgan once again up to her pretty ears in trouble for the eighth go round. 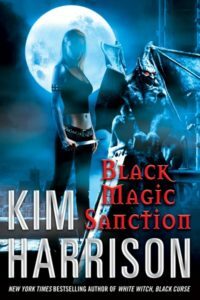 This time her deadbeat thief ex-boyfriend, Nick, has ratted her out to the witch council. They now want to sterilize her or imprison her to prevent her demon blood seeping back into the witch population. Rachel is minding her own business in the grocery store when a deadly agent from the council attempts to take her in with no explanation. Needless to say, she is not into going down without a fight. After a second attempt, she finds herself locked up in Alcatraz with black witches deemed too dangerous for society. The only escape is to have her friends use Al (her demon tutor) summoning name to whisk her back to the church. To Rachel that is rock bottom. Being summoned like a real demon by coven of black witches forces her truly confront her demon blood heritage. She finally decides to fight fire with fire in this book. I couldn’t be more delighted. Pierce encourages her to use more black magic, which even Al warns against. He has taken Pierce as his familiar and assigns Pierce to babysit Rachel since she can’t be trusted to not get herself into trouble. The alternative is to live out her days as a fugitive in the demon world. No thanks. She must track down Nick to get back the tome that started this whole mess. Nick is terrified of her, as he should be. Though it depresses her, she uses it to her advantage to manipulate him into giving her what she wants and a place to hide. That little rat is very good at hiding. This book certainly kicks up the action and stakes. I’m thoroughly hooked for the remainder of the ride. Expect more reviews of The Hollows series for CBR 9. Share the post "The one where Rachel embraces her dark side"